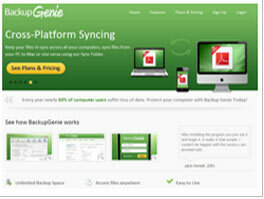 Backup Genie becomes one of the most rich-featured and comprehensive storage solution after its establishment in 2011. Their ever evolving strategies lead them into breaking new grounds and crossing different verticals, showing their passion for technology and progression. Backup Genie innovative products are desired to make life easier. Backup Genie provides multiple options at very affordable price starting from 75 GB for $ 4.49 per month to unlimited space for just $ 9.95 per month. Their solution is designed to silently sync your files in the background automatically without any interference to your work. Backup genie offers robust and powerful backup storage with different backup type; Full, Incremental, Differential and Mirror - to suit your requirements. Virtual backup to any media including FTP/FTPS, Amazon S3, CD, DVD, Blu-ray and Network. Basic and advance level of schedulers are provisioned in Backup Genie. You can use Pre-and-Post backup commands and benefit from multi drive spanning. Backup Genie can assist you in locating your lost or stolen through its locate function. Next time when your system got connected through internet you can map its location. Their data centers have features like HVAC, ultra-redundant power and network system with no single failure point. Backupgenie Reviews, Backup The Photos and Videos On Your Mobile to the cloud Data Storage. Access files stored on your computer from your mobile device.